Some marine biologists have called the curious and often playful giant sea bass the “Labrador retrievers of the sea” – which partially explains why these tremendously large fish (which can weigh up to 500 pounds) are currently on the critically endangered list. These gentle giants have struggled to keep their populations viable as humans have over-fished them in the 1930s and later killed them with gill nets and spearfishing in the 1950s. With the coastal gill net ban in 1994, the few remaining bass ever so slowly started to increase their numbers. Now, the public can help scientists identify and monitor the giant sea bass that reside off the Southern California coastline. 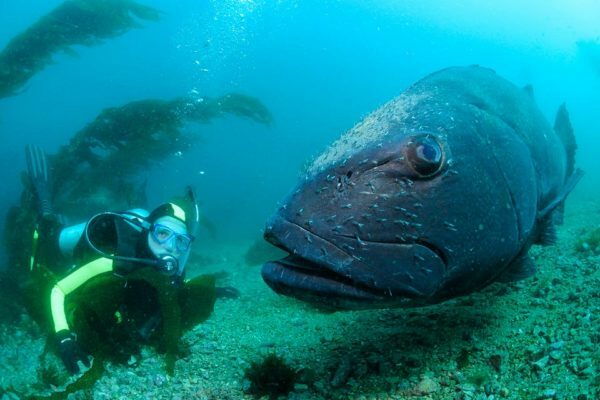 The Spotting Giant Sea Bass is an interactive website that invites divers and snorkelers to snap and upload photos along with location details of the bass they encounter; spot patterns can be matched and identified to track individual fish. The brainchild of UCSB researchers in collaboration with the Aquarium of the Pacific, the website makes matches by using pattern recognition algorithms first developed by astrophysicists to spot patterns in star constellations and later used by NASA on the Hubble Space Telescope. Sea bass encounters can be rare since there are an estimated fewer than 500 breeding individuals existing in California. Scientists are hopeful because a pre-launch website testing revealed more than 100 individual bass discovered from the Northern Channel Islands to San Diego found within four different marine protected areas. Scientists say that having a healthy population of giant sea bass is necessary for a healthy ecosystem. As a top apex predator in kelp forests, these giants eat pretty much anything that swims: rays, small sharks, flat fish, etc. It’s not picky. The fish also has longevity on its side – they can live up to 75 years old. Through data collected on the website, marine biologists can track the bass population and movements, maybe discover spawning grounds, potential threats and other bass behavior. Divers/snorkelers too can enjoy the thrill of discovery as well; when you upload your bass images, you can opt to receive notification when “your” fish is spotted by another diver.